What would it be like to game on the PC South Korea uses to talk to North Korea? 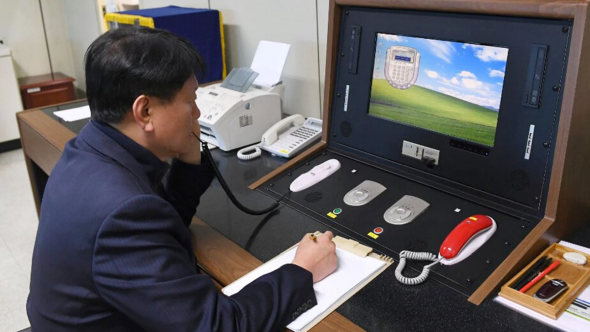 North Korea has reopened its hotline to South Korea. On Wednesday afternoon, the secretive state rang its nearest neighbour with the intention of organising a visit for the Winter Olympics next month. After two years of radio silence, this is a significant diplomatic development at a time when communication with the North could not be more important. It is also an opportunity for us to ogle South Korea’s rig and speculate about its capacity for PC gaming. Read more: the best games you can play on PC right now. First things first: is it definitely a PC? On the desk where a South Korean official sits to make contact with the North, there are two phones. Beyond the phones, encased in lovely mahogany, is a dedicated communications console. On its screen is an image of green rolling hills, which the more experienced PC users among you will recognise as the default desktop background of Windows XP. Guys: it’s a PC. A PC running an operating system more than 16 years old on a monitor no larger than the spread of President Trump’s tiny hands, granted. But we can work with that. Look on the bright side: it predates Games for Windows. Alright, so how are you going to get the games on it? South Korea, PC gaming heartland that it is, has the world’s fastest average internet speed. But the rig in question is in Panmunjom, a village 53 kilometres from Seoul and situated just beyond the North Korean border. Given that a row over a jointly developed industrial park is the reason communication broke down in the first place, it seems fair to conclude that the two countries have not yet broached the tricky subject of fibre cabling. Steam’s not an option, then. What else is there? Observe the periphery of this artfully deconstructed PC and you will notice not one but two CD drives – installed in an avant-garde, vertical configuration that would wow the crowds at CES. I mean the discs are going to fall out a lot, aren’t they? ‘Cos of gravity. But I reckon you only need mangle two or three in the drive’s doors before a successful installation. Where’s the mouse? Moreover, where’s the keyboard? Alright, check out those USB expansion ports. Just like the ones you plug your keyboard into, right? You might have to bring your own from home, but it looks doable. Failing that? They used to say it was impossible to complete Dark Souls using only a Rock Band guitar. That you couldn’t main Doomfist with a motion-controlled boxing glove. I think you can handle playing PUBG with two phones, some buttons, and a couple of weird roller balls. Hang on, I just realised something. Two CD drives. What sort of machine has two CD drives? Two USB hubs? The sort of PC that is actually two PCs. Think of the possibilities: you can play on your main and alt MMO accounts at the same time. It is the perfect streaming setup. And the more you imagine yourself winning a chicken dinner while wearing a pinstripe suit with four buttons on the sleeve, the classier it sounds. Despite initial appearances, I think this might be a dream rig. Alienware and MSI, you might want to make a few calls yourself.